Baby shopping can quickly add up and before you know it, you’ve been convinced there are so many things you ‘need,’ that you’ve blown your budget. To help you whittle down your list, Which? asked 2,000 parents to rate their most, and least useful baby products. 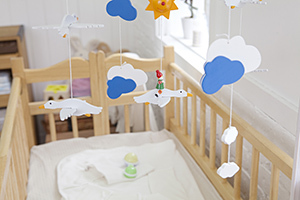 There are clearly a lot of cot mobiles gathering dust in Britain’s cupboards – they have been voted by parents as the least useful baby product. This makes sense, given that their usefulness depends a lot of your baby’s preferences, and that they can actually hinder baby’s sleep – a nightmare for tired parents. Door baby bouncers were voted the least useful product last year and the year before, and remain on the latest list, coming in second. On the other hand, stair gates are still a favourite, winning the most useful product for the third year running. 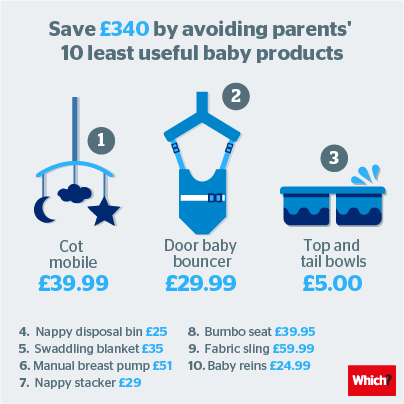 In adding up the cost of the ten least useful products, we’ve found that you could save £340 by avoiding these purchases*. For that money you could have your pick of the three best pushchairs we’ve tested, or a Best Buy child car seat with plenty of spare change. To compile the lists of the most and least useful products, we asked parents with children under five years to rate the products they own on a scale of 1 to 10 for usefulness. We’ve excluded the core baby purchases of a child car seat, pushchair, high chair, and cot, as these are considered essentials. A lot of the products that were rated least useful were ones that you could find a cheaper alternative for, or could use something you already have. For example, top and tail washing bowls consistently place in our list of least useful – you could just as easily use regular plastic bowls. Nappy bins and nappy stackers also made the list as products that many parents found superfluous – as you could just use disposable nappy bags and a normal bin or bucket with lid instead of a nappy bin, and a normal nappy box or changing bag will usually do in place of a dedicated nappy stacker. Other products included on the list were those that prove to be quite divisive, including baby reins and Bumbo seats. Manual breast pumps made the list of least useful, but electric breast pumps were rated higher. Stair gates continue to be popular, and are seen by a lot of parents as a safety essential. If you’ve got stairs in your house, you’ll need a safety gate before your little one starts to become mobile. Browse our stair gate reviews to find out which are the best. This year, the Moses basket entered the top 10 most useful products, so it’s still worth considering even though you can only use it for the first few months. Parents also said they got a lot of use out of their baby monitors – both audio and video, with audio rating slightly higher. You can find out more about which type might be best for you with our tips on how to buy the best baby monitor. For the full list, head to top 10 most useful baby products. *Saving calculated from items in Mothercare December 2016.